A simple and ecological means of economically perfecting the treatment of wastewater at the end of passing through a conventional treatment plant. Treating via buffer zones with willow plantations (or reed beds) is based on the purifying power of willow trees (or reeds). Indeed, like aquatic plants in a lagoon, willow trees have a high capacity to clean the water of its nitrates and phosphates. 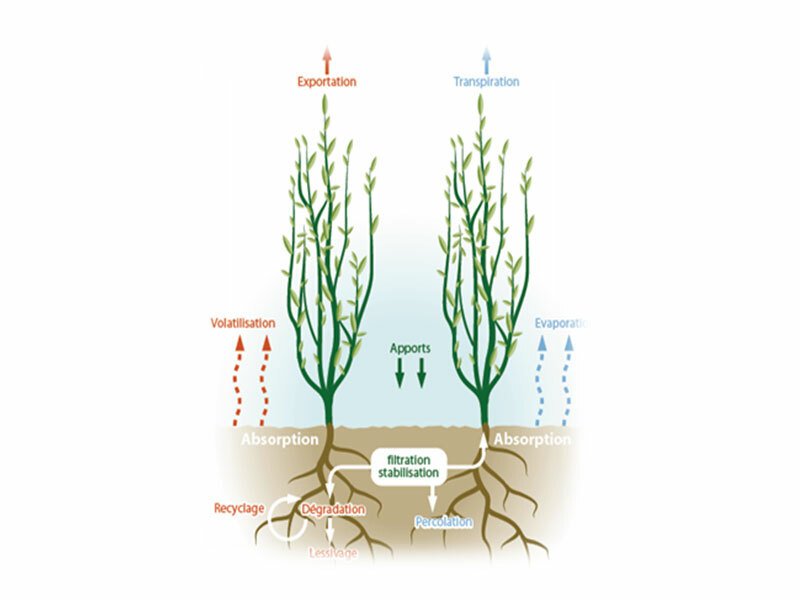 Willow trees can destroy an average of 60% of the harmful nitrogenous matter. This process is of Swedish origin and has enjoyed much success for a few years now. It has been set up in many towns around the world, with several variations, in particular the intensive culture of willow trees supplied by effluents. The use of willow plantations (or reed beds) has many advantages. It is a very ecological method as it allows for the natural breakdown of pollutants that are insensitive to the chemical treatments in conventional treatment plants where they are usually not treated. As such, the water discharged into the environment after passing through a willow plantation is much cleaner ; the environment is preserved. 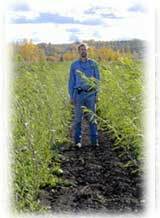 In addition, willow trees supplied as such can then be used as biomass. The biomass produced as such is the most ecological that exists as it is estimated that the production of C02 given off by the combustion of willow trees is "negative" (willow trees absorb more CO2 for their growth via photosynthesis than their combustion gives off). In addition, this method provides an aesthetical aspect to the whole. 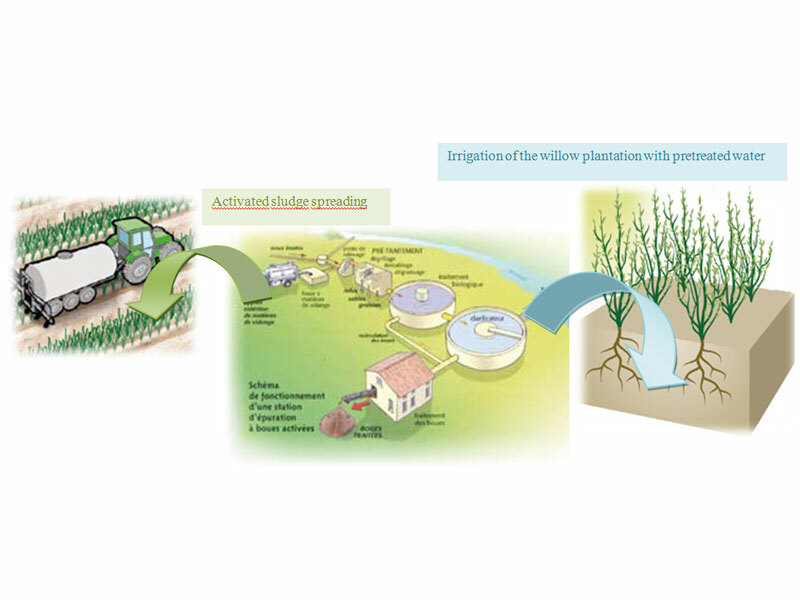 This method can be used wherever the climatic conditions allow for the growth of willow trees. Therefore, temperate to continental climates are preferable. This method is a tertiary treatment at the outlet of the treatment plant, it therefore concerns urban areas where the habitat is concentrated enough to justify the presence of a genuine treatment plant. 5) What does this process involve ? How is it used? The treated water irrigates these plants which are nourished and grow. The water is purified when it has passed through the zone planted with willow trees (or reeds). When the process is also used for an intensive culture of willow trees, the latter are planted with a very high density and are harvested mechanically every 2 to 3 years. This method is also used for the treatment of activated sludge coming from activated sludge treatment plants. This allows for natural recycling and an agricultural valorisation of the latter, thus participating in the creation of biomass. The water discharged after passage through the willow plantation (or the reed bed) has a much lesser load in terms of nitrates and phosphates, which avoids polluting the ground and water tables. This method can be an alternative to incinerating activated sludge, by valorising the latter. Moreover, it allows for a supply of energy. 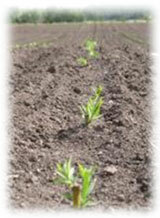 A very large area is required to plant willow plantations (not as much space is needed for reed beds). This therefore cannot be done for treatment plants where the available space is limited. 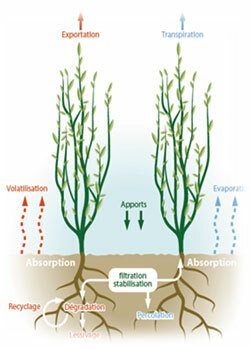 In Canada, a willow plantation is entirely irrigated by the water coming from the Whitecourt treatment plant (Alberta). Willow trees have enjoyed rapid growth, ranging up to 160 cm in a few months for the best performers. This installation was created with the main purpose of producing biomass.